LED Sign Boards LED sign boards in Bangalore LED acrylic display and 3D acrylic letters are the latest way of representing your brand. They look more premium than normal glow signs boards, and are much more reliable and use much less power as compared to traditional signage. LED sign boards use a large number of tiny LEDs as lighting source instead of neon tube lights. 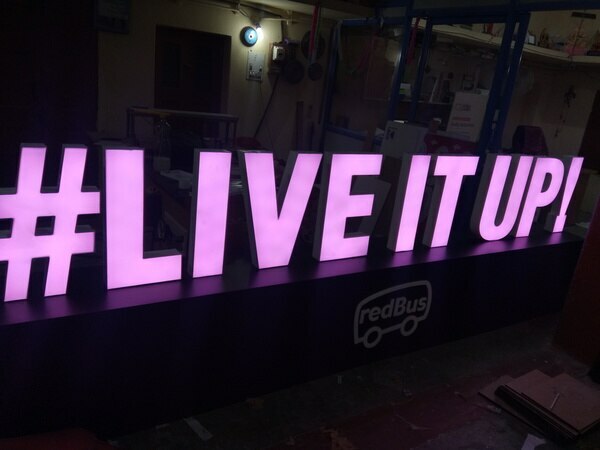 In most cases these signs are made in form of 3D acrylic letters with lighting embedded inside. They can be placed on building facades, walls and rooftops. We undertake signage design, morphing and preview, fabrication and installation of signs all over India. S R Enterprisess is the leading sign board manufacturers of Bangalore. Recently we have manufactured sign board of Ashraya Upahara Hotel.